Making something more luxurious than it already is might sound simple, but is often not so. The right MB Sprinter is a beautiful base for enhanced customisation and tweaking, as Topstar Transporter soon discovered. With its sleek design, you can envisage this Sprinter featuring in Hollywood heist films. As part of its bespoke luxury fleet, this customised Mercedes-Benz Euro 5 Sprinter 516CDI has been converted into a luxury limousine coach. It’s visually outstanding; the finish of the black paintwork is superb. Topstar Transporter Pty Ltd has purchased the one we are driving and it’s obvious why it is proving to be very popular. 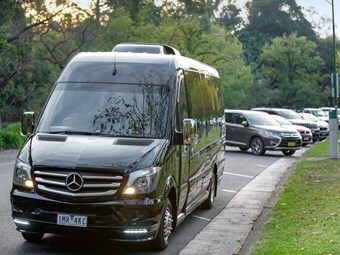 We are driving through busy Melbourne traffic as this vehicle will commonly do; we could be doing an airport pick-up and or dropping passengers to their hotel in central Melbourne – in heavy traffic it is a breeze to drive. Going through a carpark with speed humps, the body weight and spring-load ratio is perfect; body bounce and movement was very comfortable for an unloaded vehicle. The double-glazing makes for a very quiet ride. There’s a small amount of noise from the air-conditioner, which is to be expected. There is a small amount of air noise from the door, but as this is a brand-new vehicle we are told it would be a small adjustment to make the plug seal work perfectly. Other than that? It’s a super-quiet drive. The plug seals work to eliminate the wind noise the larger vehicles commonly get at the entry door. The driveline has dual-circuit hydraulic brakes with floating caliper front and rear disk brakes. As expected from a Mercedes-Benz, it is car-like in every way. The Sprinter has ABS, ASR (acceleration slip regulations) and BAS (brake assist). In the heavy traffic, no opportunity arose to really test the brakes other than standard braking – general feel was impressive. The Sprinter uses a 163hp 2.2-litre common-rail direct-injection engine with a seven-speed G-Tronic transmission and Blue Efficiency emissions technology, a faultless combination. As with every drive, we are seeking what’s in it for the driver. There is a driver’s SRS airbag, cruise control and a remote central-locking system. The driver’s area is super comfortable. Vision is amazing as expected with the huge amount of glass; the mirrors have no blind spots and are the standard ones as fitted without additional upgrades needed. There is a multi-function steering wheel, so all your data is at your fingertips – impressive drive for us drivers. Yet the one feature we didn’t get to have a go of – and regret not pushing for – is the Topstar Sprinter karaoke system. Awesome! If you’ve never done karaoke on the road before but do a pretty good Bon Jovi in the shower, this one might be for you. Overall it’s an exceptional drive with oodles of luxury to impress. It’s certainly one to look at in this size range. Patico Automotive is based in Dandenong, Victoria. Founded in 2006, it imports and distributes bus product with the aim to bring to the Australia and New Zealand market a range of high-quality market-proven products that can be marketed at a mid-market price point. Part of its philosophy is to only represent vehicles that have been extensively proven in global developed markets prior to introducing them to our shores. 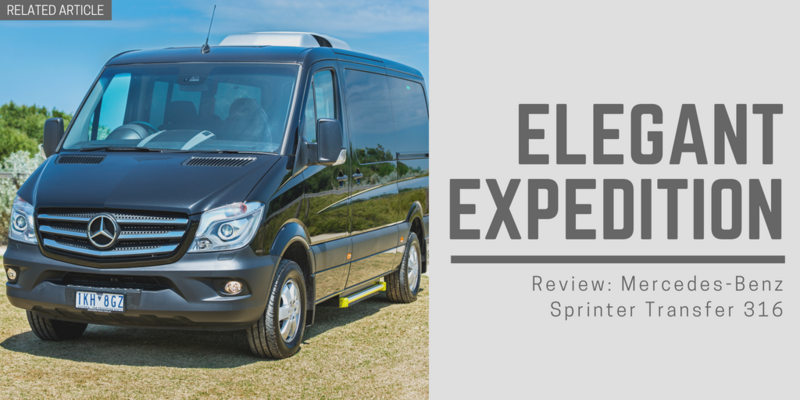 The Mercedes-Benz Sprinter is the second of Patico’s niche vehicles that we’ve taken for a test drive this year; the Sprinter Classic is certainly one head-turning vehicle that includes some added features. The luxury tourism vehicle market in Australia is certainly growing in both popularity and the range of features being introduced to ensure that we are keeping up with global advances – and each product has its own features that ensure it stands out in the crowd. Speaking with the sales director of Patico Automotive, Michael Robinson, we were keen to find out how this deluxe vehicle came to be – the process is not as simple as importing and being ready to roll. According to Robinson, "We buy the Ventura van with the longest wheelbase, closed roof available in Dusseldorf, Germany. We bring that in and, to meet Australia compliance, we need to put in rollover [protection] to meet ADR 59/00. We put in roll bars to meet this and we have had to actually roll two of these to get compliance; we also had to move the fuel tanks further away from the doors to meet Australian standards, there’s a whole lot of things that happen behind the skin to make the Sprinter what it is." Robinson continued: "In the range at the moment we have the Shuttle, which is what you would call the basic model that can be a 22- or even a 23-seater, if you use the original swing-out door. We have a guide seat that folds down so that makes it a maximum of 24 in total including the driver. The shuttle is aimed at the rent-a-car-type market, the Thriftys and similar companies to give them bus opportunities. The model up from that we have the Classic. It’s just a matter of going further and further up the scale depending on what your needs are." Our test drive vehicle today was certainly ‘all options included’. "With the Classic, we incorporate in the price the spec of the test drive vehicle – the larger double-glazed glass, the internal parcel racks are extruded aluminum with led lighting, and the high-performance saloon air-conditioning from Mercedes-Benz. The overall effect is a luxury midi coach," he said. The fit-outs are all now being done by a company in Adelaide and Robinson is super happy with the work done. Using it has the added bonus of adding jobs to the Adelaide workforce, so a positive relationship for Patico. What options are there for air-con? Robinson said, "There are two types of air-conditioning available for the Sprinters. You have the driver’s system that comes standard on a Sprinter, which comes out through the dash outlets. And we have a roof pod system for the rear saloon area. There is a Tropical Pac that is around four grand more, but this comes fitted as standard on the Classic – it’s perfect for the harsh Australian operating conditions." To obtain a fit-out of this quality and a vehicle as good looking as this one, the important price question had to be asked. "The shuttle is around AUD$128k plus GST and the Classic is $145k plus GST. For the $17k difference you are getting high-level seat trimming; in this one it is the Styleride locally made seats. These are manufactured in Brisbane especially for the Sprinter and they are ADR68, which is over the meter because we’ve fitted more steel underneath to secure the seats – that’s part of meeting the ADR rulings," Robinson explains. "There’s double glazing; the air-conditioning; the upgraded seats; driver’s microphone; Wi-Fi system; GPS; reverse camera; cruise control and speed-limit function; plug door; LED lighting for stairwell and the entrance; plus there is a choice of a carpet runner in the isle or quality wood grain flooring. There’s stainless embellishment on the wheels, door handles, mirror and the grille. Just to give a luxury look we add skirts, front and rear bumpers – they all help give a more coach-like visual appearance. The chrome mirrors and wheels are standard, but certainly look great against the black paintwork," Robinson said as he rolls out the upgrade list to us. Robinson explained: "Two very different vehicles for two different markets. The economy version that is just to move people is a great vehicle for capacity transport, but saying that it is still a far superior vehicle and is better fitted out in comparison to other similar vehicles out there. Remembering you have all the better ride qualities, it has great road handling and it has great fuel efficiency, ABS and cross-wind stabilisation with extended service intervals. It is vastly superior in its running gear just with a more economical fit out. We find in the market in Australia it really gets down to cost per seat. Patico has both ends of the market covered with the Mercedes Classic and Shuttle." Topstar Transporter is only a fairly new business with a name it feel reflects its focus on the VIP and luxury end of the tourism market from overseas. When ABC magazine spoke with manager Wibi Santoso, he explained: "Our target market is Indonesian and Malaysian guests as that is our background. Some of our guests like that we can speak their language, whereas some also like to have the Australian drivers to give them a more local Australian service, but sometimes they will specifically ask for a driver that speaks their language. of-mouth and referrals are much more powerful than relying on social media and advertising alone to get customers. "We find, culturally, Indonesians really listen to friends and family; friendships are really important to us. We also do a lot of work for tour operators and agencies that contact us because they have a group of Indonesians visiting and they know what we do," Santoso said - proud of the level of service Topstar brings to its niche market. "At the moment we have three vehicles, but we access other vehicles from our coach partners as we need them. We find that is the most economical way to access a larger coach when you consider maintenance and all the costs of owning bigger vehicles. Most clients are inbound tourists and the corporate market. We have larger groups with the VIPs requesting their own vehicle to be separate from the group. Often groups want a driver, but the flexibility to organise their own itinerary, that’s where we can give them what they need. Having a range of different vehicle types gives us the flexibility to cater for both the competitive budget market and higher-end, discerning upper market." Santosa said, "We believe that everyone we do business with is relationship building. It’s all about the relationships and that how we have built our business. Close relationships mean the people we work with can ask anything of us without hesitation. "Every time we meet someone new we show them that we respect them by looking after them. It gives us pleasure to make people happy; every time it’s like building a friendship." When there is a growing range of vehicles to choose from on our market, why was Patico chosen? "We have a GL that is an eight-seater and we have a normal Sprinter that is a 14-seater. We were looking at purchasing a VIP vehicle. The 19-seater allows the seats to recline and add to the luxury feel. We have used Styleride seats in a wool blend for comfort," said Santoso. "Additional things we had added to this model were the Styleride seats, the upgraded timber flooring, the karaoke system, we have a fridge-freezer, we have Wi-Fi, GPS, CCTV inside and out and dashcam, the black paint wasn’t standard, tinted windows and tow bar, and the power invertor and the panoramic double-glazed windows – this eliminates the need for curtains. "People stop us everywhere and say ‘love your bus’. We are always getting compliments and people stopping to ask us about it." I guess with comments like that, Topstar shows just how happy they are with their luxury purchase and just why they chose Patico and the luxury Sprinter. Sometimes it is very much about the looks.